Leading Manufacturer of solar panel from Bhopal. Dexterous, hardworking and dedicated professionals have helped us in presenting the finest grade of Solar Panel. 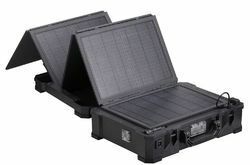 Their low failure rate, consistent performance and sturdy construction make these solar power packs highly demanded. In order to meet the precise needs of patrons, we render the solar power pack in various technical specifications.